Fabian Cancellara won his 4th World Championship Time Trial last Thursday in Geelong, Australia at an average speed of 47.048 (on a bike!). 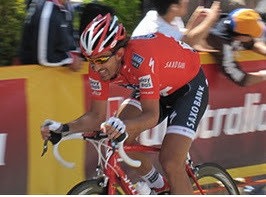 Cancellara won by 1:02.75 seconds in 2010 in Australia, he won by 1:27.13 seconds in 2009 in Mendrisio, 0:52.1 seconds in 2007 in Stuttgart, and 1:01.29 seconds in 2006 in Salzburg. He dominated! Taylor Phinney recently beat out Levi Leipheimer for the US National Time Trial Championship by only 00:00.2 seconds. It was that close. That is usually how it goes in time trial races - unless Fabian Cancellara shows up! Considering every man out there was giving it his all, Cancellara won Worlds by a lot of seconds, 62.75 seconds! Plus Cancellara's bikes have changed over the years, his competitors have changed, and each of the 4 courses were completely different. It is an amazing achievement to be World Champion 4 times. He is more than a Champion he is one of the best cyclists of all time. Born in 1981 in Wohlen Swizterland to Italian parents who had immigrated from San Fele, Cancellara found an old family bike in the garage at age 13 and was immediately hooked on cycling. Four years later he was the Junior World Time Trial Champion, for two years in a row. At age 19 he came in 2nd at the U23 World Time Trial Championship. That same year he signed with his first professional cycling team - Mapei. Cancellara had moved from the Juniors to the Pro level, pretty much avoiding the U23 category. At that time, it was believed that doping was more prevalent in U23 than in the Pro ranks. Giorgio Squinzi, head of Mapei at the time, both acknowledged this and recognized Cancellara's potential. Squinzi commented that Cancellara was going to be "the future Miguel Indurain". After two seasons with Mapei, Cancellara joined Fasso Bortolo from 2003-2005, where he worked as lead-out man for Alessandro Petacchi. By 2004 he began to show real results in the big races, coming in 4th at Paris-Roubaix, and winning the Prologue of the Tour de France. In 2006 he changed teams again to CSC and really started producing big wins. 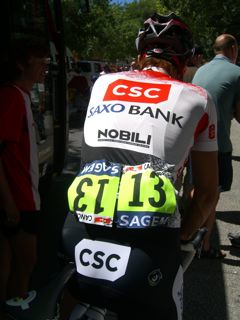 In 2009 he joined Saxo-Bank. In 2011 he is rumored to be joining the Luxembourg Pro Cycling Project team along with his good friends Andy and Frank Schleck. One of the most surprising facts about Fabian Cancellara is his height and weight. He is larger than the average Pro Cyclist at 186cm (6'1") and 80kg (176lbs). He supposedly also enjoys snowboarding and mountain biking. He is married with one daughter. 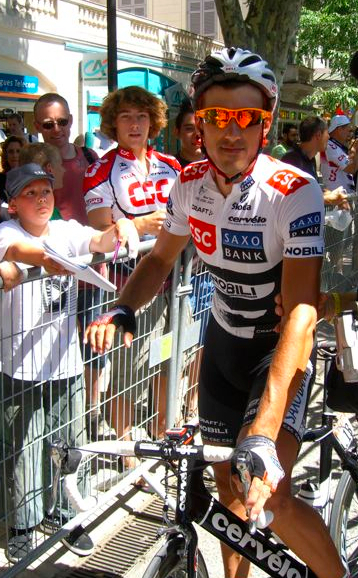 He has his own Fabian Cancellara Fan Club. In his racing career Fabian Cancellara has won an Olympic Gold Medal, The Road World Time Trial Championships four times, the Paris-Roubaix two times, the Tour of Flanders once, the Tour de Suisse once, Milan-San Remo once, and has worn the yellow jersey for 19 days during the Tour de France. He was the National Road Champion of Switzerland in 2009. Cancellara is so amazing to watch on a bike, I think videos might be the best way to profile him. I also think it is very interesting to look at the difference of form between Tom Boonen and Fabian Cancellara. Cancellara has so much strength in his back and hips. This video is from the 2010 Paris-Roubaix, when Cancellara famously rode away from Boonen. Full Gas: Riding a Time Trial with Fabian Cancellara (Intro) from Halo Films Ltd on Vimeo.